Our family of clockmaking companies includes five of the most reputable names in British Horology. John Smith & Sons, Midland Clock Works, Derby Ltd.
John Smith (1813 – 1886) trained under the famous Whitehurst family of Derby clockmakers. He set up on his own first as a millwright during the day and repaired domestic clocks in the evening. He was able to build up sufficient capital to move to the well-known Clock Works in Queen Street and start turret clock work in earnest. His early designs of hand wound clocks used the horizontal or flat-bed cast iron frame favoured by Lord Grimthorpe (designer of Big Ben). He also used either his double three-legged gravity or a reliable pin wheel deadbeat escapement. The power to weight ratio of these clocks was better than any made by other manufacturers. They continued to be hand-made until the 1930s and have been used occasionally for important installations since. Frank Smith (1852-1913) & his younger brother John (1857 – 1910) had been made partners by their father and took over the running of the business after his death. Using newspaper cuttings to guide them to potential business they built up a very successful business. Their cuttings books are held in the company archives along with nineteenth century ledgers and marketing material. Their attention to quality and reliability of product and service continue to this day. It was under their guidance that the Great Clock of St Pauls Cathedral, London, (the BBC’s stand in for Big Ben on several occasions) was made and installed in 1893. Howard Smith, also John, (1907 – 1983) was a true turret clockmaker. He designed our first and subsequent synchronous electric movements and their associated electro-mechanical bell striking units. He also designed our first auto-winding units which paved a way to preserving the use of existing clocks. Howard combined a profound affection for the traditions of horology with enthusiasm for new technology. He advised the then nascent Council for the Care of Churches Clocks sub-Committee in the 1960s, and also the Landmark Trust in its early years. His diaries recount thousands of visits to clocks old and new across the British Isles from the 1940s to the 1970s. He was involved in the major new clock and carillon made to celebrate Derby as a new diocese in 1927. A huge number of clocks were maintained, restored or installed under his long stewardship of the company. Jonathan (Joe) Smith (1967 – to date) is Professor of Environment at the Open University and also serves as an active director of Smith of Derby Ltd. He represents the fifth generation in the business. In a period when people are increasingly recognising the importance of ‘place’, Joe is convinced that the company and wider industry has more relevance than ever. Other members of the family are involved as directors of the holding company, Smith of Derby Group Ltd, including Victoria Millar (4th generation), Heather Whitworth (5th generation) and Gordon Smith (5th generation) who is currently residing in Denmark. A number of members of the sixth generation have already had work experience within the business or contributed their knowledge and skills in varied ways. In recent years, we have had the benefit of leadership from outside the family. Peter Sully served as Managing Director (1996-2006) and masterminded the move from split sites to Alfreton Road and improved our profitability. Peter continues to support the company by applying his formidable knowledge within the sales team. Former chairman Roger Leivers (2006-2013) brought our corporate governance up to date and informed the development of an international export strategy. Most recently Jeremy Bowler, a very experienced chairman, has worked with Bob Betts (2007-to date) through a period of sustained investment in our skills and products. Recent years have seen steady expansion of our traditional work and the development of significant new export markets. The Potts family originates in the North East of England and became involved in clockmaking, when Robert Potts was apprenticed to a clockmaker in Darlington in 1790. Our William Potts (son of Robert), was born in December 1809. William was apprenticed to Samuel Thompson, a Darlington clockmaker. At the age of 24, in 1833, William was persuaded by a friend to move to Pudsey near Leeds to set up his own business as a domestic clockmaker and repairer of clocks and watches. In due course he became interested in the growing demand for public clocks and started to carry out maintenance work of public clocks in the vicinity. The business expanded in jewellery and silverware as well as clocks and watches. In 1847 William was selected by Lord Grimthorpe to make a new clock for the Ilkley Parish Church. This was the start of a lifelong friendship which produced many introductions for further work in which Lord Grimthorpe was involved. By 1862 the business had expanded to the point where it was necessary to be closer to some of the more major customers such as the Corporation of Leeds. So a new shop and workshop premises were taken in Guildford Street; later a new turret clock factory was opened in Cookridge Street, Leeds and mass produced wall clocks for schools, offices and railways. In the next fifty years the business became well known throughout the United Kingdom and supplied numerous public clocks to cathedrals, churches and town halls as well as schools and to stable blocks for country houses. Three of William’s sons eventually joined their father in the business and in due course it became known as William Potts & Sons Limited and the firm was at its peak between 1880 and 1910, during which period there was an enormous demand for tower clocks at the close of the Victorian era. A further generation joined the business after World War I but their time with the company was short lived as Tom Potts left in 1928 to operate on his own and Charles Potts left in 1930 to set up his own turret clock business at Marshall Mills in Leeds where it remained until the 1950’s latterly under the control of Anthony Potts. 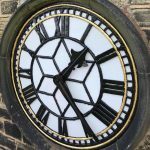 The former business of William Potts & Sons Limited has remained very active and specialises in the maintenance and restoration of public and Church clocks as well as the manufacture, supply and installation of modern public timepieces and bell sound systems. J B Joyce & Co is the oldest firm of tower clockmakers in the world and can trace their history back to the year 1690, when William Joyce began making grandfather clocks in the North Shropshire village of Cockshutt. The family business soon flourished and was handed down from father to son and eventually in 1790 moved to Whitchurch. They operated from premises in High Street and in 1834 Thomas Joyce embarked upon making large clocks for local churches and public buildings. In 1849 the Company were instrumental in manufacturing a double three-legged gravity escapement, after the design of Lord Grimthorpe and this was later used in the Great Clock of the Palace of Westminster, more commonly known as “Big Ben”. This invention revolutionized the timekeeping of large public clocks and has been hailed as the greatest invention since the pendulum. The firm’s reputation spread and contracts for large clocks were won for many public buildings, both at home and overseas. The Company also made clocks for some of the principal railway companies both in Britain and the Commonwealth. In 1904, the business was moved yet again to a purpose built factory in Station Road, from where it has continued to operate to this day. The company joined the Smith of Derby Group in 1965 and covers the west half of the UK; Wales Northern and Southern Ireland and the Isle of Man. 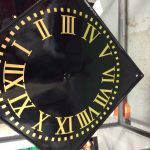 James Ritchie & Son (Clockmakers) Ltd.
James Ritchie & Son specialises in the manufacture and service of large steeple and public clocks, developing an expertise which has kept pace with technological trends. More modern designs utilise synchronous electric drives and electronic controls but the company still service and restore mechanical clocks over 150 years old.